ARTISAN SUPPLY Serving Bowls are made of polished 304 rust-resistant double-walled, insulated interior with durable brushed 304 stainless steel exterior for ultimate heat protection and heat retention. A must-have addition to your dinnerware set and cooking supplies, these non-slip, scratch resist and break resistant bowls ensure you of quality and longevity. Practically unbreakable, these are built to last a long time and can withstand the harshness of daily use. These metal serveware can practically be used with any kind, any type of food, be it dessert like banana split, creme brulee, pasta, use it as nut or candy jar, decorative dish, orange or lemon holder, key or coin tray, potpourri container, office catchall, large or small jewelry plate, modern centerpiece or decor, or entryway display,or even as pet bowl, dog or cat food and water bowl! For all occasions: birthday, debut, graduation, bridal shower, wedding, anniversary, bridal registry gift, gift for the holidays, Christmas, New Year, Valentine's Day, thanksgiving, homecoming, housewarming and house blessing! For school and university canteens, culinary arts use, dinnerware collection. Take it anywhere you go: on a travel, school excursion, camping trip, the beach. PERFECT FOR HOT AND COLD FOOD - These heavy duty, double deck metal individual serving bowls are engineered with a double-wall design that enhances your dining experience and works great in keeping rice, soups, and noodles hot without scalding and keeps ice cream cold without condensation so it doesn't slip from your hands! Serve fresh and healthy meals every time! NO METALLIC TASTE - Unlike most poorly-made plastic bowls that give a strange taste and smell to your food, with Artisan Supply meal prep bowls make sure that your meal will stay fresh, delicious and healthy. Enjoy Asian inspired food like Thai curry, Chinese, Japanese, and Korean noodle dishes, fried rice, stir fry, miso soup, dumplings, stew, With these beautiful bowls, your home cooked meals can feel like you are eating out at a fancy restaurant. HEAVY DUTY AND SHATTERPROOF - These prep bowls are made of premium quality food grade FDA approved and BPA free stainless steel that resists dents and is corrosion resistant, making it the best choice for you and your children. Durable and lightweight, you can use it for any occasion or take it anywhere! Designed for multi use, are ideal for entertaining inside or outside the home. Also great to use for salad, cereal, oatmeal, appetizers, chips, dips, nuts, and other snacks. DO NOT MICROWAVE. EASY TO CLEAN AND STORE - These versatile storage bowls are great for a variety uses, including restaurant & deli takeout, food savers, and are recommended by fitness experts for meal prep, portion control, and 21 day fix. The thoughtful stackable and nesting design of this bowl set makes these reusable stainless steel bowls ideal food prep containers. Optimal as a fruit bowl, snack bowl, serving bowl, dinnerware or as small mixing bowls. Refrigerator safe, freezer safe and dishwasher safe. 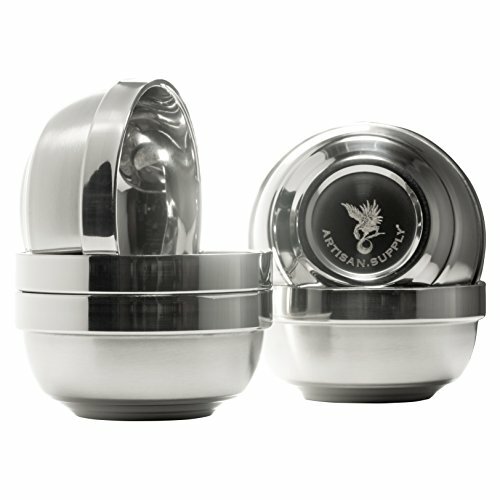 CONVENIENT SIZES - Each bowl has 13-ounce capacity and is 2.6 inches in height, 4.7 inches in width, and 3.5oz in weight. These insulated food bowls are perfect for adults, kids, toddlers, seniors. Ideal for use in the kitchen, hotels, restaurants, hospitals, hiking, camping, backpacking, travelling, RV. With LIFETIME GUARANTEE! Trust a 5-Star Product and the LIFETIME Replacement and Refund policy of Artisan Supply. Order Yours Today! If you have any questions about this product by Artisan Supply, contact us by completing and submitting the form below. If you are looking for a specif part number, please include it with your message.